By Dan Ambrose: Lucas Matthysse (39-4, 36 KOs) was surprisingly behind on one of the judges’ scorecards at the time he knocked Tewa Kiram (38-1, 28 KOs) out in round 8 last Saturday night at the Forum in Inglewood, California. Judge Pat Russell had the 25-year-old Kiram ahead by a 68-65 score through the first 7 rounds of the contest. The other 2 judges had Matthysse comfortably ahead 69-64 and 68-65. Matthysse made sure he took the judges out of the equation in round 8 in knocking Kiram down 2 times in scoring a knockout at 1:21 of the round. It is surprising that one of the judges thought Kiram had done enough to be leading in the fight by a 68-65 score. That doesn’t make a lot of sense when you look at how much running and holding the Thailand was doing. It was pure spoiling from Kiram, and so hard to watch as a boxing fans. Kiram did not look like he was there to try and win the fight. Kiram fought more like a fighter that was doing his utmost to see the final bell in round 12 and hope that he could maybe get lucky and win a controversial decision. With the victory, the 35-year-old Matthysse won the vacant WBA World welterweight title. 35 is old for a first-time world title winner, but the Golden Boy promoted Matthysse was in the perfect situation in facing a fighter with an inflated resume of nothing but weak opposition. Kiram probably would have nowhere near unbeaten if he’d been fighting good fighters through most of his career instead of the no name fodder that he’d built his resume on. Kiram would have been exposed long before he got to the point where he fought for a world title against a fighter like Matthysse. That’s one reason why it’s important for sanctioning bodies like the World Boxing Association to make sure they rank only fighters that have been tested against the best and proven that they deserve to be rated highly at No.1. The WBA had Kiram ranked No.1 with their organization going into last Saturday’s fight with Matthysse. If you saw Kiram’s resume you’d likely laugh at how horrible it was. Only the WBA knows why they decided to rank Kiram at No.1. Matthysse landed 59 of 246 punches for a connect percentage of 24, according to CompuBox’s stats. Kiram connected on 55 of 277 punches for a 20 percent connect rate. Just going on the punch stats, it’s difficult to know who won the fight. They weren’t lopsided in Matthysse’s favor. What the stats don’t show is how the fight played out. Kiram was running and holding for the entire fight, and just trying to keep from getting brained by Matthysse. It was not one of the more fun fights to watch until the last minute of the contest in round 8. Matthysse’ fights are usually exciting affairs with lots of drama. But he couldn’t catch up to the constantly moving Kiram enough last night to take him out quickly. A fighter that would have done very well against Kiram is Errol Spence Jr. With the way that he cuts off the ring, he would have likely knocked Kiram out in the 1st or 2nd round. Of course, Spence is considered the best in the 147 lb. division right now, so it’s not hard to imagine that he would obliterate a limited runner like Kiram quickly. If Kiram had been more stationary and not always moving, he probably would have been able to generate more power on his punches. But he was too afraid to sit down on his shots for fear of being nailed by one of Matthysse’s big punches. By not standing and fighting, Kiram invited more pressure from Matthysse. Going into last Saturday’s fight with Kiram for the vacant WBA ‘regular’ 147 lb. title, Matthysse had come up empty in his 2 previous attempts to fight for a world title against Viktor Postol and Danny Garcia. Matthysse was not ready to defeat those types of styles. The defeats by Matthysse seemed to help him for the Kiram fight, as he was ready to deal with the height and reach of the Thailand fighter a lot better than he did against Garcia and Postol. Matthysse did have problems with the movement and size of Kiram in the first 7 rounds. It wasn’t until the 8th round that Matthysse was able to hurt Kiram with a left-right combination that put him down. The left hand connected first by Matthysse, and then he followed it with a looping right hand that nailed Kiram right on the jaw. Kiram was leaning backwards to try and keep out of range of Matthysse’s follow-up right hand, but it still connected and put the Thailand fighter down on his back next to the ropes. It was all Kiram could do to get back to his feet and resume fighting. 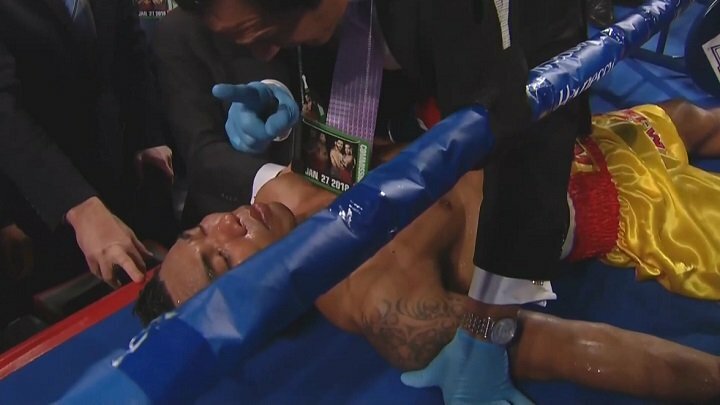 When the action resumed, Matthysse landed a shot and Kiram shook his head to let him know that he hadn’t hurt him. Kiram then landed a right hand on the top of Matthysse’s head. However, Kiram wasn’t prepared for Matthysse to shoot out a left hand that hit him square in the face. Kiram couldn’t take the shot and he dropped to the canvas like a sack of potatoes. It wasn’t a big shot, but Kiram wasn’t expecting it, so it did a lot more damage. The WBA title that Matthysse won last night is the secondary belt for the organization at 147. Keith ‘One Time’ Thurman has the main title called the WBA Super World welterweight belt. The referee warned Kiram about his holding in the fight in the 6th, but he refrained from taking a point away. Kiram listened to the warning from the referee and did nothing to stop his constant holding. Matthysse’s win puts him in position to face Keith Thurman at some point. Thurman is fighting in April against an opponent still to be determined, after that he’s expected to face Shawn Porter in a rematch. For Matthysse to get a fight with Thurman, the WBA will need to order that match to take place. However, Matthysse wants to fight Danny Garcia or Manny Pacquiao. Kiram was badly hurt from the knockout. He was reportedly taken to a hospital to be checked out after the fight. The knockout punch that Matthysse hit him with, a jab, didn’t look like the type of shot that would leave Kiram on his back, motionless, but I don’t think he ever saw the punch coming. It was a jab that was perfectly thrown by Matthysse, and it looked like he put some weight behind it. Still, you must question Kiram’s ability to take a good punch. Kiram’s punch resistance is questionable.